Interior Designers in Yelahanka﻿ - Wall Decoration Ideas In Budget. Wall Decoration Ideas In Budget. Beautiful walls are a dream of every homeowner because they add special charm to your home. The Interior Designers in Yelahanka believe that you don’t need to spend a huge amount of money because it’s efforts that matter most. If you have enough time to spend decorating your walls, the below tips are for you. You can not only save some bucks, but your walls will also be happy. Let’s have a look at 17 money saving wall decorating tips. Wall art is one of the best ways to decorate your plane walls. If you are done with paint, but the walls feel empty and boring, wall arts are your way. They will not only add interest to walls but are also easy to install. Wall stickers increase the options for you. They come in various sizes and patterns. The wide variety helps you to select the best ones according to rooms. For example, you can get cartoon stickers for kids room, butterflies for a living room, and many more. Indoor plants are our all-time favorite when it comes to decorating interiors. The Interior Designers in Yelahanka suggest wall mounted planters to enhance your walls. Indoor plants work like an air purifier, and that’s how you get double benefits with them. You can choose from a wide range of wall mounted planters according to your taste. Mirrors are known for adding space to a little room. They are widely used in interior designing because of the look they give to the room. Hang mirrors in the open area of your walls and you are done. You can buy round decorated mirrors for a better look. Mirrors in the room also make you feel confident. Yes, we are talking about kitchen plates. They look really elegant when hanged on walls. If you don’t feel comfortable hanging the plates on your living room or bedroom walls, decorate your kitchen walls. You can change the plates whenever you want, and that will look so cool. Nothing can beat family photos, because they make your home feel like yours. Pictures hold memories of good days, and that’s why they are the best thing to put on your walls. Make a family collage, or hang separately framed images of the whole family. You can do this trick on every wall of the home. How about covering the walls with canvas? Paint your canvas with latex paint, and you will get something outstanding for your walls so easily. If you are good at painting, it’s a good way to showcase your skills. Moreover, it’s better to paint a big one so that it covers the whole wall. Light fixtures are a must have for every home. You can make your walls look better by using artistic light fixtures in your home. 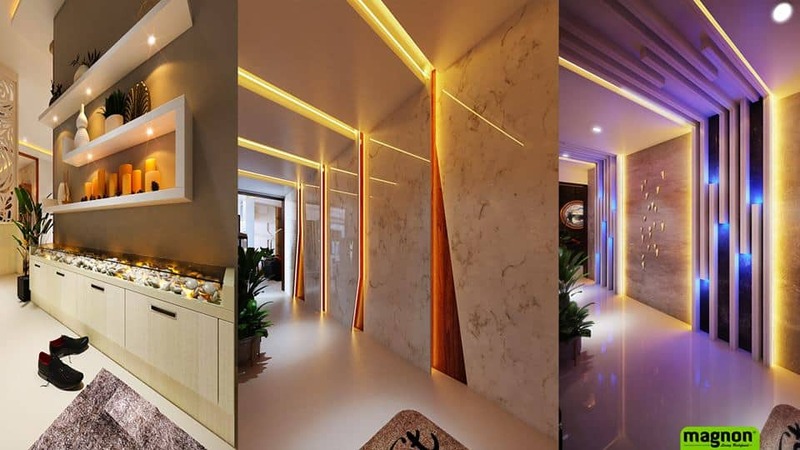 You can find a wide variety of beautiful looking wall and ceiling light to decorate your home. The Interior Designers in Yelahanka suggest buying round shaped fixtures for the ceiling. Being experimental with colors can also help in decorating your walls. For example, you can decorate all the walls with different colors. Both bright and neutral colors create a special effect, and you can cover your walls according to the type of atmosphere you want to create. Wallpapers are ages old solution to decorate your home walls effortlessly. They are inexpensive, can be easily purchased and they are easy to put on walls too. The best thing is they change the look of the wall in no time making it look beautiful in no time. You can easily find wallpapers that cover a complete wall. Moreover, you can also frame them to create a different look. We usually don’t appreciate walls without paint. But, creating a rusting look by adding an extra layer of bricks on a wall can make it so much better. The brick walls look so good when the finishing is done properly. Plus, they do need paint so that the rough look of bricks doesn’t spoil the whole room. If you are thinking about something simple yet elegant, textured walls can easily get you a wonderful look. You don’t need to spend too much, and the appearance of walls will amaze you. The painter will give texture according to your choice like waves, vertical or horizontal lines, or whatever you like to have. Tiles do a two in one role. They prevent moisture from spoiling your walls and add never-ending beauty. They are not so expensive, and the best thing is they come in so many different colors and designs. If you don’t want to cover all the walls with tiles, go for just one as suggested by Home Interior Designers in Bangalore. Nothing beats your own crafts. While decorating walls, you can show all your creative skills. For example, paint a boring lamp, or make some wool crafts to hang on the walls. You can also print some beautiful pictures or quotes to frame and add on the walls. Watch some craft videos, and you will have so many awesome ideas. You can’t think about getting a headboard when there is very little space in the room. But, painting a fake headboard can save both space and money. It doesn’t cost too much but looks realistic and beautiful. The Interior Designers in Yelahanka believes that side table also plays a great role in beautifying your walls. Though it is not mounted on walls, it’s presence near the walls is worth considering. When you have a beautiful side table that compliments the paint and decoration on walls, the room seems better.